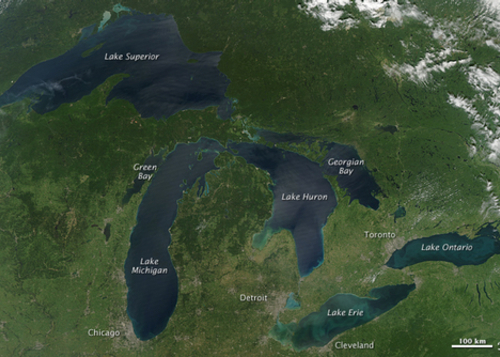 The big five, seen from space (NASA photo). You may have heard the Trump administration is rolling back policies designed to protect the U.S. ocean coastlines.You may not know it applies to the Great Lakes, too. In his order this week, Trump said he was “rolling back excessive bureaucracy created by the previous administration,” saying the Obama council included 27 departments and agencies and over 20 committees, subcommittees and working groups. The president said he was creating a smaller Ocean Policy Committee while eliminating “duplicative” regional planning bodies created under Obama. The order drew praise from a group representing offshore energy producers and criticism from environmentalists. The order encourages more drilling and other industrial uses of the oceans and Great Lakes. Waiting for a bus on Fort Street in Detroit?